IROHLA is a project that focused on improving health literacy for older people in Europe. It took stock of on-going health literacy programmes and projects and identified and validated a set of 20 interventions, which together constitute a comprehensive approach for addressing the health literacy needs of the ageing population in Europe. These interventions are part of an evidence-based guideline for policy and practice for local, regional and national government authorities to start action. Depression is common and is associated with poor outcomes among elderly care-home residents. Exercise is a promising low-risk intervention for depression in this population. Duirng this study the hypothesis that a moderate intensity exercise programme would reduce the burden of depressive symptoms in residents of care homes was tested. The findings indicated that the moderately intense exercise programme tested did not reduce depressive symptoms in residents of care homes. Therefore, in this frail population, alternative strategies to manage psychological symptoms are required. 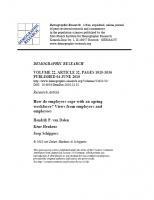 The publication is available, here. At a time of austerity, concerns about the consequences of further population ageing for the economy and for health and welfare systems are now ﬁrmly on political agendas. Although societies need to respond to demographic realities, often concerns about the eﬀ ect of ageing can be exaggerated, adding to the agendas of some governments to cut back welfare states. In this Series paper, the susbstantiality of the implications of population ageing for health, long-term care, and welfare systems in the European Union (EU) as often stated is explored together with how European societies can prepare to cope with ageing populations. 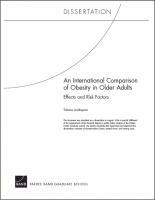 Written by Tatiana Andreyeva and supported by RAND, this dissertation draws on nationally representative samples of the non-institutionalised population aged 50 and above in ten European countries, to examine two issues related to obesity in older Europeans: (1) effects of excessive body weight on health, utilization of medical care, and labor force participation; (2) risk factors for obesity and environmental and societal variation across European countries. Eurostat - Statistics in Focus: Ageing in the European Union: Where Exactly? This paper published by Eurostat in 2010 focuses on the regional aspects of ageing (e.g. rural vs. urban, regional contrasts in specific member states, etc.). The booklet has been developed within the Bridging Research in Ageing and ICT Development (BRAID) project, that is funded by the Seventh Framework Programme. Lays out a research agenda on ageing research for the European Union.